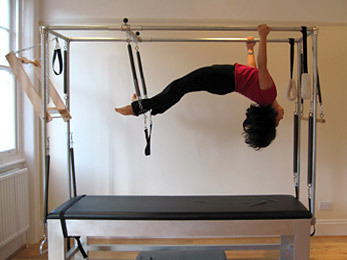 The True Pilates Method is as PURE as it is DYNAMIC, as intended by Joe Pilates. It is the original form of Pilates, as practised by Joseph Pilates, and directly passed on to his chosen successor and our master trainer, Romana Kryzanowska, based in the U.S. Only a handful of instructors in the UK are certified in the True Pilates Method. True Pilates is a REAL PILATES workout; it is neither a softy, feely stretching/ rehab session, nor is it an offspin of a loud gym class. Whatever your level or physical ability, you will be challenged and you will sweat while you practice the real art of the True Pilates Method. The well-choreographed exercises flow seamlessly from one to the next, and are adapted to the specific needs of your body. Move with great concentration, precision and dynamics without pause. Work your whole body, inside and out, from head to toe. Then work on areas specific to your objectives. Expect your session to fly by with varied movements, few repetitions and deep work, while moving to the 'rhythm of your own body'. 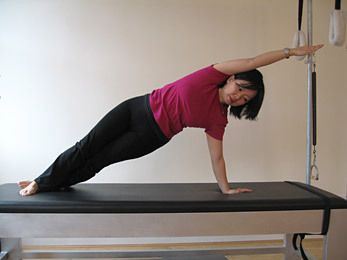 Tried and tested for over 80 years, True Pilates is still the perfect exercise regimen that gets long-lasting results. Challenge yourself - physically and mentally.